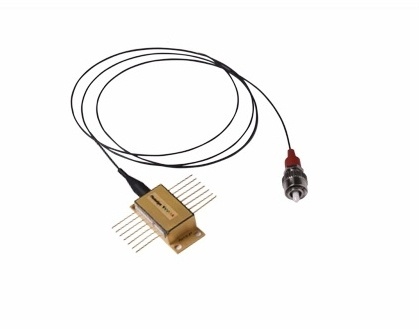 Photodigm’s standard fiber coupled DBR laser diode come in a compact 14-pin flat rectangular package. This user-friendly package is complete with Thermal Electric Cooler (TEC), thermistor, thermistor, monitor photodiode and of course the DBR laser diode. The full capabilities of the DBR laser diode may not be realized in the butterfly package due to the absence of an optical isolator within the package. This option is available with some wavelength. The package’s cavity is hermetically sealed to better than 5 X 10-8 atm-cm/sec. with design patterned after telecom specifications making it ideal for rough environments. Beam Characteristics: The single mode fiber produces a Gaussian shaped beam making it ideal for interfacing with other optical components. The fiber comes at a cost due to the ≈50% coupling loss from the DBR laser diode facet the fiber input. The delivery end of the fiber come with a FC/APC connector with over a meter of loose-tube jacketed fiber. 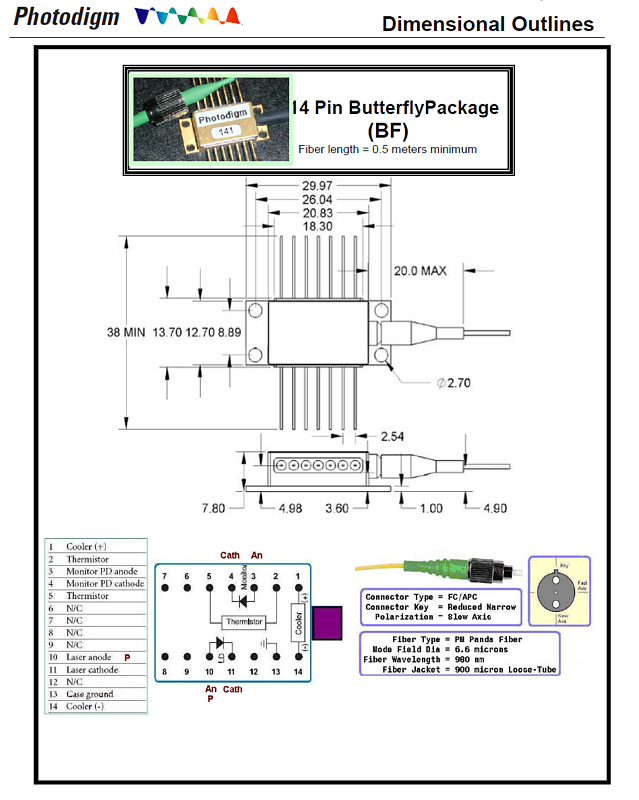 Connection: The 14-pin butterfly package is solderable to a PCB with proper heatsinking or mountable in a Newport 740 series butterfly mount.